Super Bowl - Biggest Human Trafficking Event in the US - Recognize it! Home > News > Super Bowl - Biggest Human Trafficking Event in the US - Recognize it! As previously communicated, each year when the Super Bowl, “dubbed the biggest human trafficking event in the United States” is played, millions of party going football fans will flock to the upcoming event on February 3, 2019. As Flight Attendants, we are uniquely positioned to identify human traffickers and assist their victims. Flight crews are skilled observers, and with the appropriate training, we can be the frontline against the horrific crime of trafficking. It is estimated that at least 12.3 million adults and children are enslaved around the world and that 56 percent are women and girls. Mega events like the Super Bowl are a magnet for human traffickers. Super Bowl Llll is scheduled for February 3, 2019 in Atlanta, Georgia. During the days leading up to and surrounding the Super Bowl we ask every Flight Attendant to be vigilant of the situations around you. Begin now by reviewing the indicators of human trafficking available on our website. Become familiar now on how and where to report suspicious behavior. Follow United’s reporting policy and procedure, as outlined in your Link, including using cockpit communications or other methods as part of the Blue Lightning Initiative. Ensure the term “suspected human trafficking is used when reporting your concerns to the Captain. Review appropriate Threat Level 1 Flight Attendant guide lines and actions to take when taxiing/inflight or at the gate. Call (802) 872-6199 (not toll-free) from any country in the world. Report the tip online at www.ice.gov/tips. 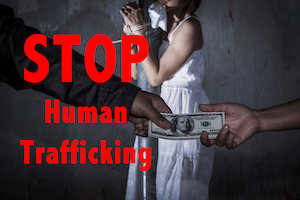 For additional information and to obtain the knowledge you need to be proactive in our fight against human trafficking go to: www.dhs.gov/humantrafficking or Take the DHS General Awareness Training.